Now: Lowered price to EUR 425,000! Two sisters, side-by-side: Blue Daisy is a copy of Regina Laska, immaculately refitted at Adams Boat Care 2013-14. Not often do you see a boat owner with such a broken heart, when he revealed to me that he might want to sell his boat. In this case, I know the boat better than anyone, possibly. We are talking about no other boat than the HR46 Blue Daisy, carefully refitted into every detail, thereby copying Regina Laska in most points. The history of the boat is such: The original owner bought her new from the Hallberg-Rassy yard in Ellös and sailed her down to Ibiza in 1998. The rest of the time it was used more or less as a balcony in the harbour, carefully cared for by professionals. When the owner got to old he sold it to Artur in 2013. He could still find some original spices once bought in Ellös back in 1998, so little had the boat been used. 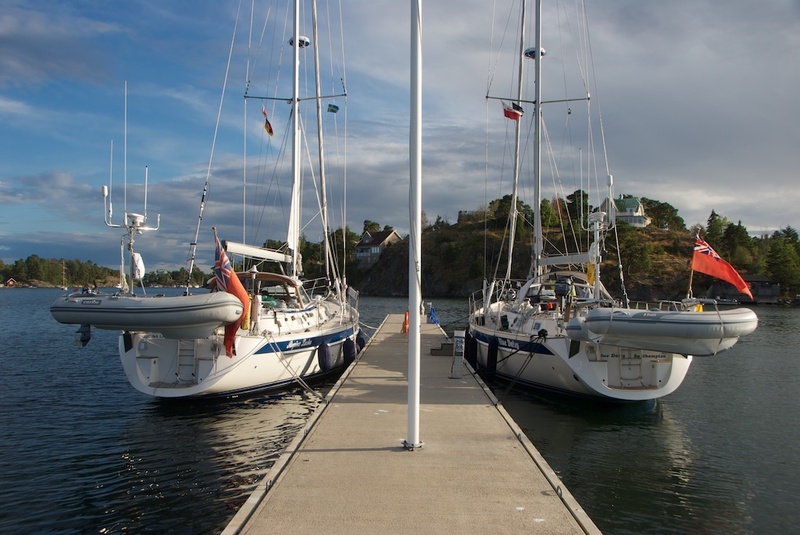 PYD (Professional Yacht Delivery) brought her back to her berth place in Sweden and during three winters she has undergone a total refit by no less than Adams Boat Care AB, the same yard who refitted my own Regina Laska. Generally, it is more or less a copy of Regina Laska, so you can check there for photos and more details. Otherwise, the refit progress of Blue Daisy is described here. Even the registered country is the same: UK. I would personally never even consider selling Blue Daisy, since she is such a beautiful boat exactly refitted and commissioned under my own supervision and no penny has been saved in order to get nothing but the very best. Please see Artur talking in the videos here. Now, you ask, why is Artur considering selling? It is due to love to his wife! I think this really speaks for Artur! Of course, Artur would love to keep Blue Daisy, and thus he is still just considering selling her. But he has hardly used her during the last summers, since his wife is not so keen on sailing. And therefore, Artur is considering spending his time with her elsewhere rather than on Blue Daisy without her. I don’t blame him for that! Blue Daisy is still at the yard on Vindön at Adams Boat Care in Sweden and will be launched in mid May. Then the professional skipper will take her down to Galicia and eventually into the Mediterranean, where Artur hopes that his wife might enjoy a week or two onboard in this warm climate. Blue Daisy could then be delivered anywhere in Europe, should a new owner find interest in this readily refitted HR46. So, rather than trying to find an old HR46 and taking the time and effort to refit her yourself, you now have the unique possibility to buy a readily refitted HR46 in an as-new state which has also been carefully tested during two summers after the refit. Everything about the boat is open and transparent, and therefore it is no secret that Artur bought the boat for EUR 240,000 in Ibiza and spent EUR 30,000 to get her to Sweden. Thereafter he spent another EUR 380,000 on the total Refit at Adams Boat Care, having invested no less than EUR 650,000 in total in the boat. After some years of enjoying sailing no more than a couple of weeks every year on his boat, he is now seriously selling the boat. Be boat is now offered for EUR 425.000. Please send me an e-mail for more information and if you wish to make up an appointment to see this boat.